The past few weeks have been busy with events that have had a powerful impact on the security of the world, and key roles in those incidents have been played by the US and directly by the US president. Those events were accompanied by rumors, gossip, analytical deliberations, and presumptions. There were various expectations leading up to the NATO summit in Brussels and the meeting between presidents Putin and Trump in Helsinki. Their consequences generated a flood of declarations and discussions. Let’s try to spotlight some of the most important moments from these events. Take a tiny example from the July 11 Brussels Declaration on Transatlantic Security and Solidarity Issues, which states that NATO poses no threat to any country. If that’s the case, then how should one interpret NATO’s bombing of Yugoslavia in 1999 and Operation Odyssey Dawn against Libya in 2011? Were the governments of these countries really not issued aggressive warnings? If NATO was not threatening the countries themselves, then it is obvious that those threats were being addressed to the nations, states, and governments, as was the case in the two instances cited. And a threat does not need to involve the use of force; just the demonstration of that force — or a declaration of intent (such as announcing the admission of Macedonia, Georgia, Moldova, and Serbia into NATO) — is enough for it to count as serious intimidation. We all know about the aftermath of the NATO campaigns — Serbia is still experiencing problems with fragments of ammunition that contain depleted uranium, and the disintegration in Libya has released a flood of migrants, in which true refugees are mingled with radical extremists from not only that nation, but also from neighboring countries. This is because under Gaddafi, Libya acted as a deterrent that ensured not only the security of North Africa, but of several of the states listed below as well. Oh, and speaking about security — in his concluding remarks, Secretary General Jens Stoltenberg, stated “Our Alliance guarantees our security, our freedom, and the values ​​we share.” However, the many terrorist attacks that have occurred in Europe in recent years cast some doubt on that assertion. In addition to those attacks, there is also an inability to cope with natural disasters — as evidenced by the recent fires in Greece, which claimed many lives. An apologist for NATO might respond that that sort of thing is not a high priority for the alliance, but security in Europe as a whole is understood to very much consist of caring for and protecting its citizens, regardless of what threatens them — be that extremist groups or the power of nature. But NATO would prefer to talk about the nonexistent, mythical threat emanating from Russia. On one hand, this can be perceived as kissing up to the US — “please don’t abandon us, we will still serve you.” But on the other, it clearly shows how NATO is a tool for Washington’s policy. 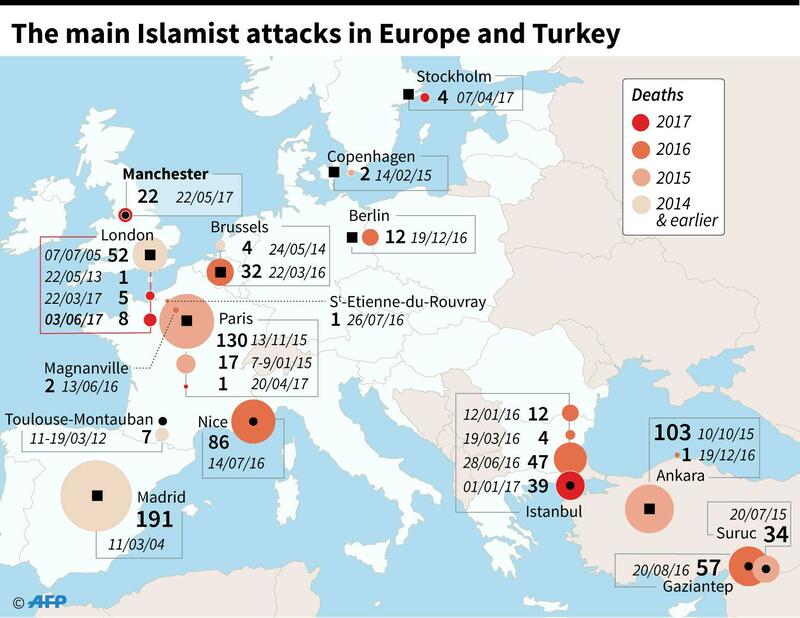 So then, what is the point of this force multiplier that is stationed in Europe? Here you have an artifact left from the Cold War. Even though when it comes to technology, NATO can be a bit underwhelming (as was demonstrated by the latest NATO exercises, after which it was acknowledged that although in a hypothesized war with Russia, the NATO countries are destined for defeat because of logistical problems, bureaucratic management, the peculiarities of the structure of that alliance, and its methods of warfare), it is still trying to justify the reason for its existence. But the realities of life changed long ago. NATO just can’t bear to let go of its favorite subject. Former Swedish Prime Minister and CIA agent Carl Bildt wrote in a July 21 article, titled “The End of NATO,” that “[t]he problem is that while NATO’s military capacity is actually improving, its political decision-making capacity is deteriorating. Imagine what would happen if a NATO member state sounded the alarm about Russia launching a secretive Crimea-style military operation within its borders. Then, imagine that US intelligence agencies confirmed that an act of aggression was indeed underway, despite Putin’s denials. “Finally, imagine how Trump might respond. Would he call Putin to ask what’s going on? And would Putin make another ‘incredible offer’ to help US investigators get to the bottom of things? Even more to the point: Would Trump quickly invoke the principle of collective defence under Article 5 of the NATO treaty? Or would he hesitate, question the intelligence, belittle US allies, and validate Putin’s denials?” Like many Western politicians, Carl Bildt forgot to mention that a referendum was held in Crimea, during which the residents of the peninsula decided their own fate. Then again, such public figures often have very predictable opinions, since they need to continue cultivating the role and status they assumed previously. After the Helsinki meeting we saw an interesting reaction to Donald Trump’s behavior, which forced him to disavow his own words after his return to the United States. This can be interpreted as not only a consequence of the pressure that he experienced from his opponents and the radicals in the Republican Party, but also the fruits of his own personal qualities, which include unpredictability, added to the ineptitude of the US president. If Donald Trump does not keep his word, this undermines confidence in him. And since he is the president of the United States, this undermines the credibility of the country and its people as a whole. Therefore, the aggressive attacks launched by the Democrats, although those were intended as a measure to discredit Donald Trump, will ultimately come back to haunt them, once they themselves end up being blamed for the deteriorating sympathies toward the Democrats and the US on the part of America’s allies and partners — not to mention its competitors. The adjunct professor of political science at Wilkes University and author of several books on geopolitics, Francis P. Sempa, noted another twist to the meeting in Helsinki, which he simply called “the return of Nixonian geopolitics.” He writes that “[t]he United States should mix engagement and containment to maintain closer relations with Russia and China than either power has with the other. Yes, Putin is a ruthless dictator, but he is no more ruthless (and much less murderous) than Mao Zedong was when Nixon launched the opening to China. At the time of the opening to China, Nixon was criticized by both the Left and the Right for conducting amoral foreign policy.” Therefore Trump has to fix Bush’s and Obama’s mistakes, as a result of which Russia and China have built up and launched various initiatives, such as One Belt, One Road, and China has also become active in the South China Sea. Although the Eurasian Economic Union is not explicitly mentioned, Francis P. Sempa clearly has it in mind. But Nixon had Kissinger, and Trump’s Pompeo hardly seems up to dealing with such a task. A few of Donald Trump’s other recent tweets that have sparked a vigorous public outcry are worth noting. The first concerns Montenegro, which, in Trump’s opinion, is capable of triggering a Third World War, due to the aggressive nature of the Montenegrins. And this again gave rise to speculation about the existence of NATO, the apportioning of the responsibility for defense within the alliance, and the percentage of GDP that should be allocated for defense. And his second tweet shifted the spotlight back toward Iran. The promises made to Israel, the relocation of the embassy to Jerusalem, and the ties to the Israeli lobby through his son-in-law, Jared Kushner, all make it clear that there is a consistent policy behind his proclamations about Iran. So in this context, should they be taken seriously? 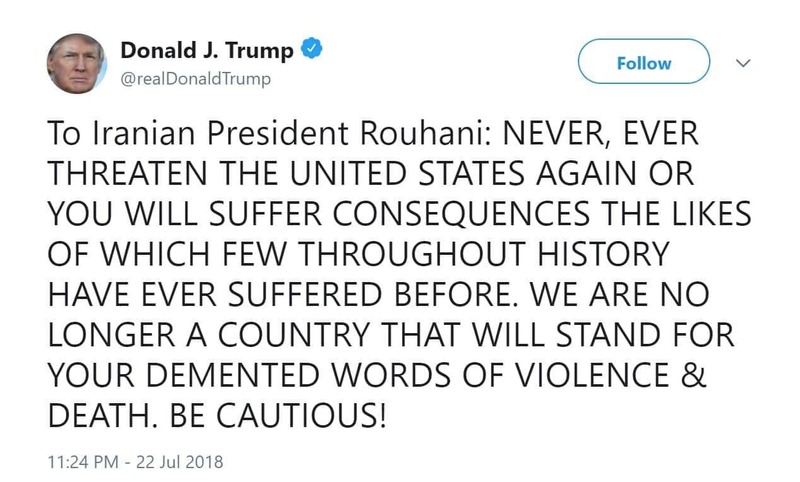 After all, Rouhani has never once threatened the US. Or did his statement about the possibility of resurrecting the Iranian nuclear program upset Trump that much? But from a geopolitical perspective, Iran does not represent an existential threat to the US — that is evident from the glaringly obvious fact of geography and any comparison of the two nations’ military strength. We haven’t heard so much about the threats from China and North Korea in the general buzz of information, but no one has forgotten about Russia. The hackers in Moscow who have for so long been such a popular topic of conversation among the spokesmen for certain US political forces and media (although without any evidence that has ever been presented) are now again allegedly acting up like the hooligans they are — this time by hacking into the electrical grids. At the same time, serious debates are being conducted about the readiness of the voting systems and the various sectors of the US economy that are in any way tied to the Internet. Everywhere the experts are claiming to be cash-strapped. Such “coincidences” lead one to the obvious conclusions.